Marble is a beautiful and exotic stone that can be used in many settings. From kitchens and baths in the home to extravagant lobbies in the best hotels, marble has become a symbol of class. 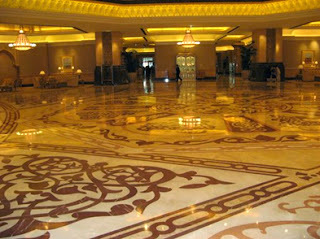 As with all natural materials, the maintenance and cleaning of marble is essential to preserving the look it provides. Classic Marble Restoration has over a decade of experience in the cleaning and polishing of marble, granite, terrazzo, and many other natural stone surfaces. Much like the paint on a new car, the appearance of your marble surface is prone to scratching, dulling and chipping through time. Our marble restoration experts have the experience and tools to make your marble look like new again. We use “dust free” methods which utilize water to catch any loose particles for easy clean-up. Marble polishing is a service that we take great pride in. The best cleaning materials and state of the art equipment are used with our meticulous step by step process to bring your marble back to life. We have earned a reputation for being the best marble restoration company in south Florida because of our thorough polishing methods. Our highly trained and experienced technicians are very well versed in marble cleaning as well. With our knowledge in which marble and stone can be cleaned with certain chemicals and products, we can make sure that you never have a negative reaction to the finish of your stone surface. We also offer sealing products and services to help protect your granite surfaces from future staining and discoloration. Servicing Palm Beach, Broward and Miami-Dade Counties, we are a family-owned, father and son operation. We provide our services to homeowners, commercial property owners as well as yacht owners. Our company is fully licensed and insured and we are experienced in all types of marble, granite, Terrazzo and all other natural stone surfaces used for countertops, floors and showers. If you need any natural stone services in the south Florida area, contact Classic Marble Restoration for a free estimate today.